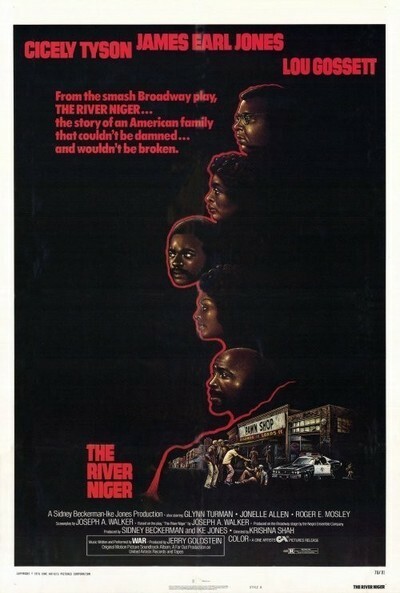 "The River Niger," a film about a series of crises in an American black family, has good intentions and several very well-acted scenes. But its direction is a mess, and its story falls victim to what might be called the Billy Jack Syndrome. That's the syndrome, inspired by the movie of the same name, requiring a serious film to be serious about everything - to grapple with all the social issues the author can possibly work in. "Billy Jack" ranged from civil rights to gun control to ecology, with many a stop in between, and "The River Niger" is scarcely less ambitious. We've had, by the time it's over, so many confrontations, so many courageous stands, so much soul-searching and so many issues that we're overwhelmed. The movie concerns a few days in the life of the Williams family in the Los Angeles ghetto. The father (James Earl Jones) is a painter, enthusiastic drinker, visionary and poet. The mother (Cicely Tyson) is sensible and long-suffering. The grandmother (Hilda Haynes) has license to be a character: She sleep-walks in search of her bourbon bottle. And the son (Glenn Turman) is expected home any day from the Air Force. Before he returns, his fiancee arrives at the home and introduces herself. She's from South Africa, she says - although she doesn't explain how or why she got to the United States, and maybe that's just as well. Given the weight of the other issues about to be considered, the movie's not ready for the South African problem. Members of the son's old pseudo-revolutionary street gang turn up, too, and one of them makes a half-hearted assault on the girl, apparently for no better reason than to inspire histrionics. construct a character out of confusion.